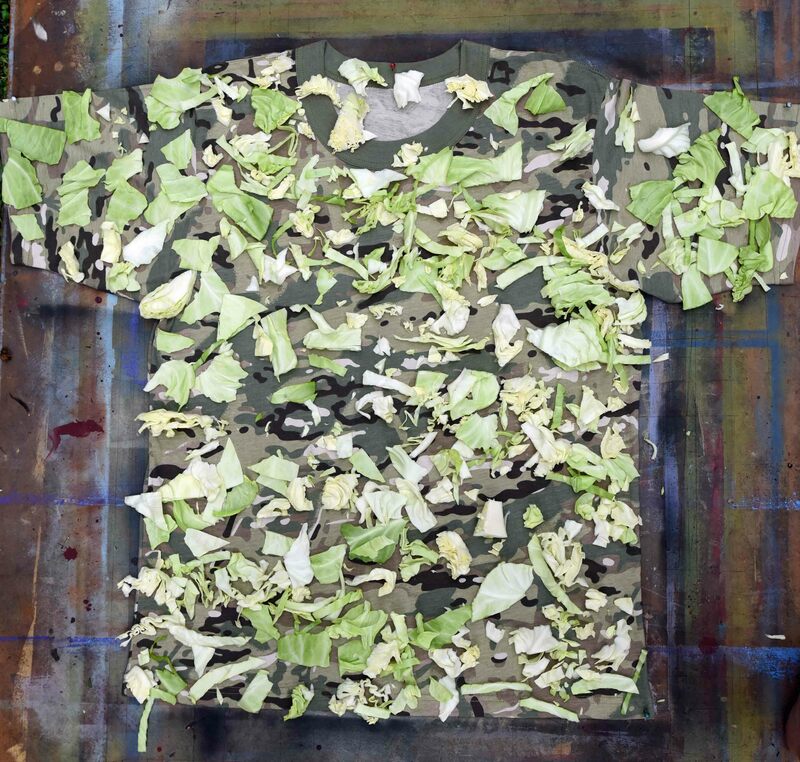 Multicam copy T shirt modified to suit a dark forest interior, placing cut cabbage over the shirt and spraying with mat black paint. David Clode. 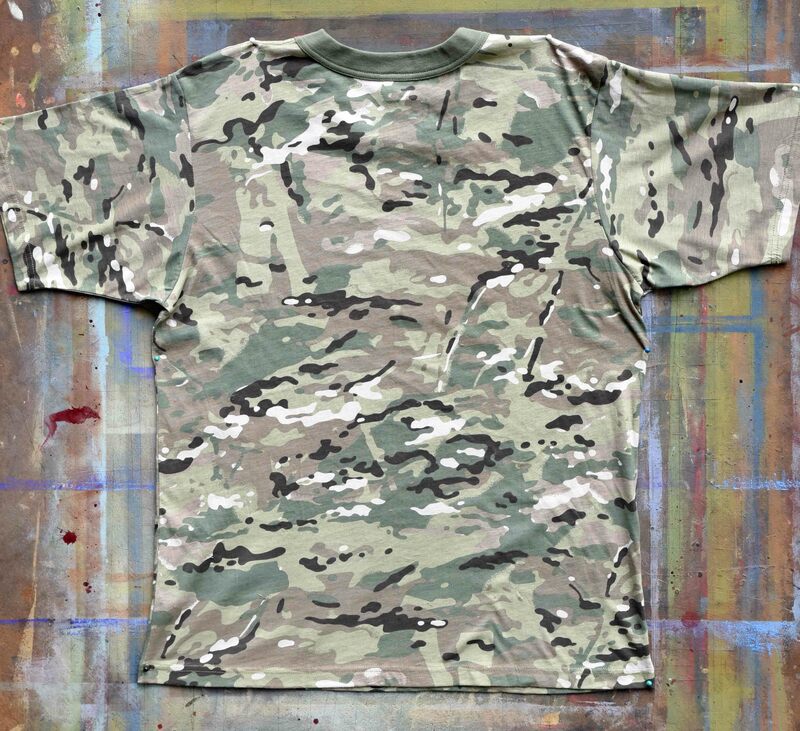 A do-it-yourself spray paint method of modifying MultiCam or similar camouflage to improve it for dense, dark woodlands, or for semi-arid terrains such as dry grassland through to deserts. I have tried to keep this example as simple and as cheap as possible so that it is available to everybody (you don’t have to be an artist or rich to do this). 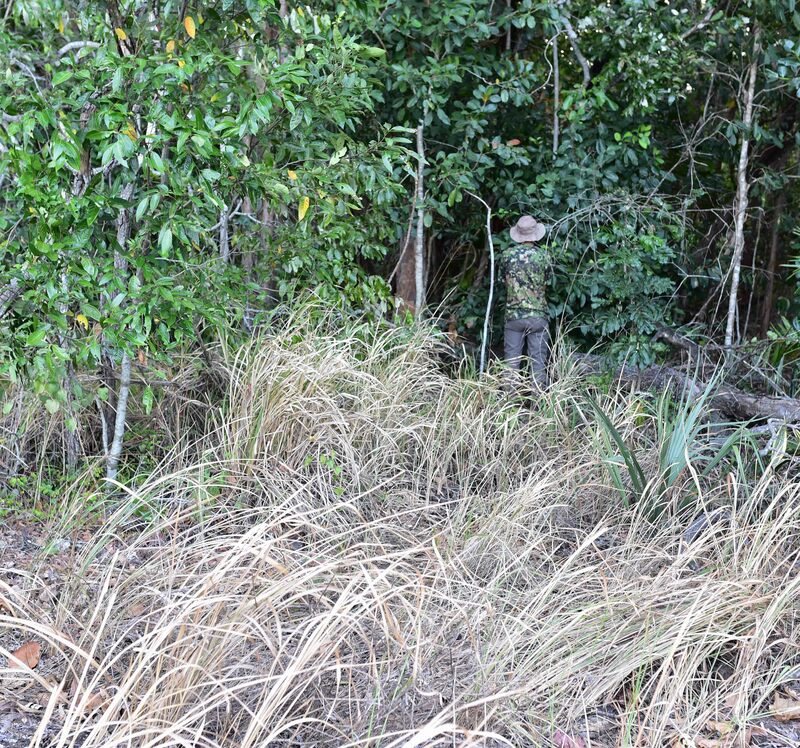 The method may be of interest to soldiers and anti-poaching rangers who may have camouflage which is inappropriate for the terrain. 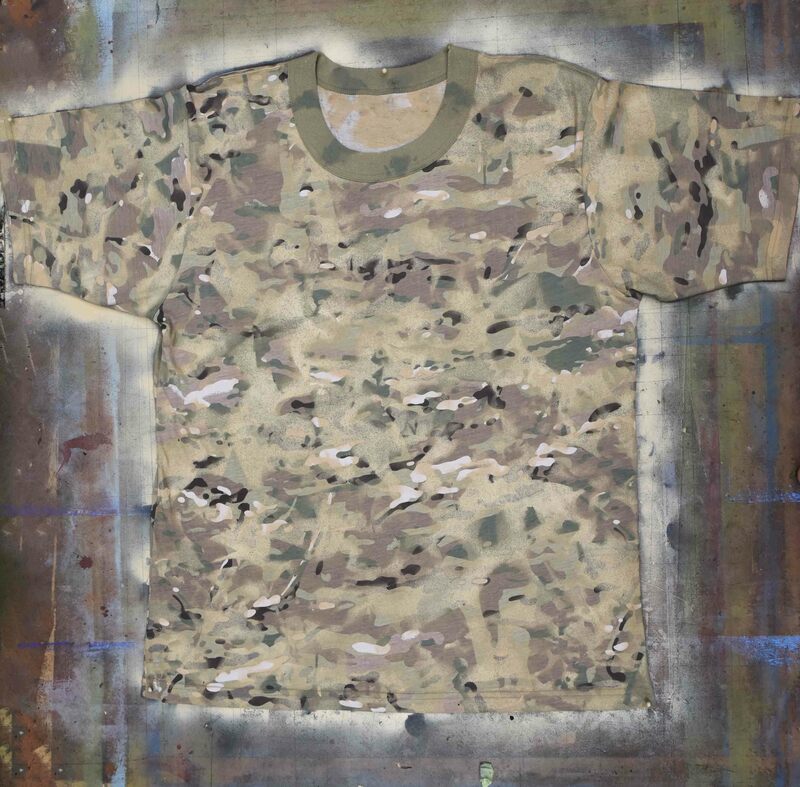 MultiCam and its variations are excellent camouflage designs, intended to work very well to reasonably well in many terrains. It is nevertheless unreasonable to expect them to work very well in the most extreme wet (often darker and greener) or dry terrains (often lighter with little or no green). Numerous possible alternatives to MultiCam, MTP and Scorpion can be found on the “Home” page and the “Multiple Terrain Camouflage” pages of this site. MultiCam has a green “Tropic” version and an “Arid” version. Perhaps there is a case for a darker “Woodland” version. This experiment is just an interim/temporary or next best option (for example, for conservation organizations that are short of funds). 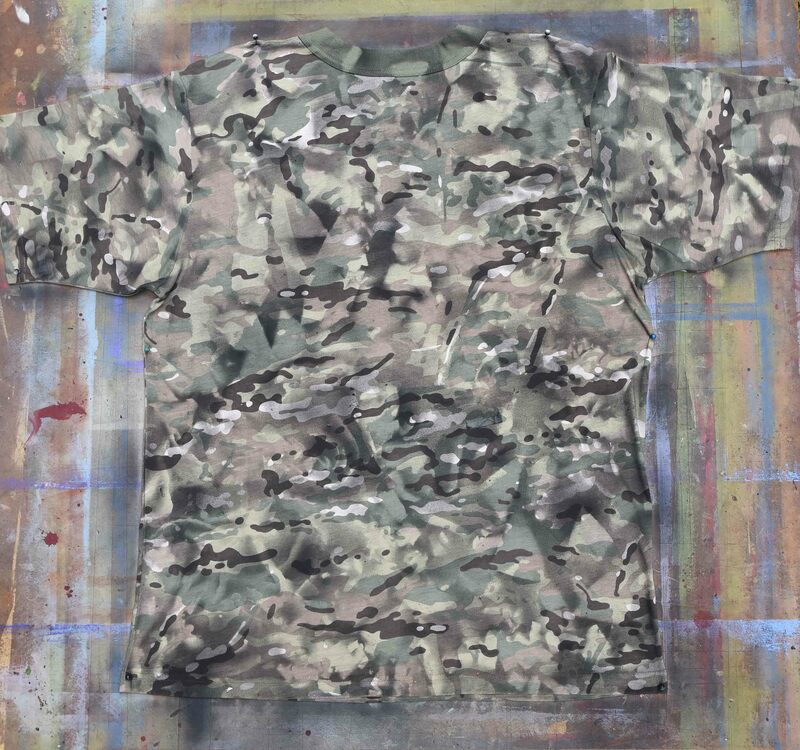 The T-shirt used in this experiment/method is a copy of MultiCam, but is close enough to MultiCam, British MTP, Australian MultiCam, etc., to show what can be done. 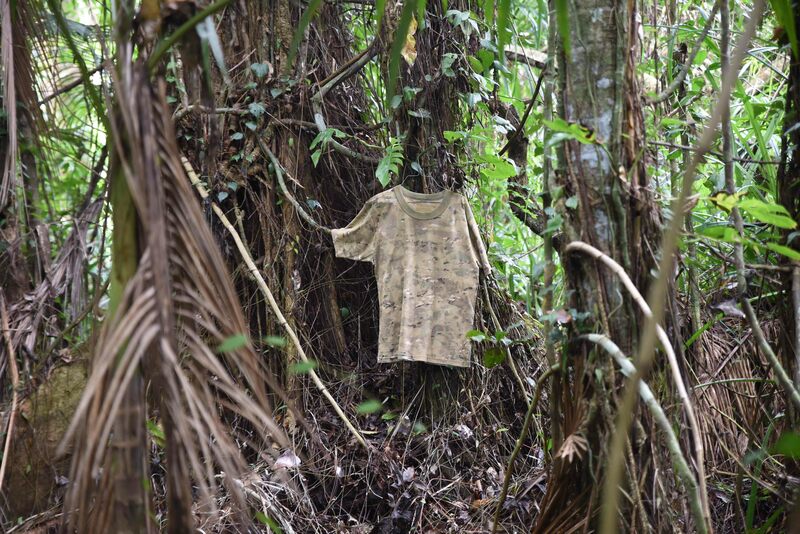 The T shirt is somewhat light greenish and a little more like MTP in that respect, and darker than MultiCam, which explains why it actually worked rather well in the interior of a rain forest (genuine MultiCam is too light to work well in most dense dark forests). The photos of the dark forest version were taken over four days, and all in very similar weather conditions (dull to bright overcast) and at the same time of day (within half an hour of 3pm/1500 hours), so there are few or no significant variables, and the camouflages are therefore realistically comparable. The forest terrain has been further divided into three subterrains: “in between space” in the forest interior, forest edge, and tree trunk in the forest interior. 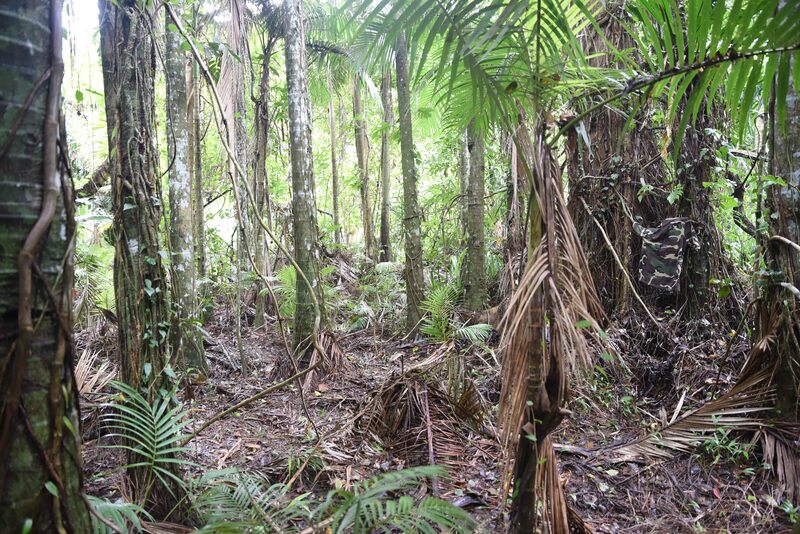 The forest in this experiment is a tropical rain forest in North Queensland Australia, but would be similar to tropical rain forests around the world. 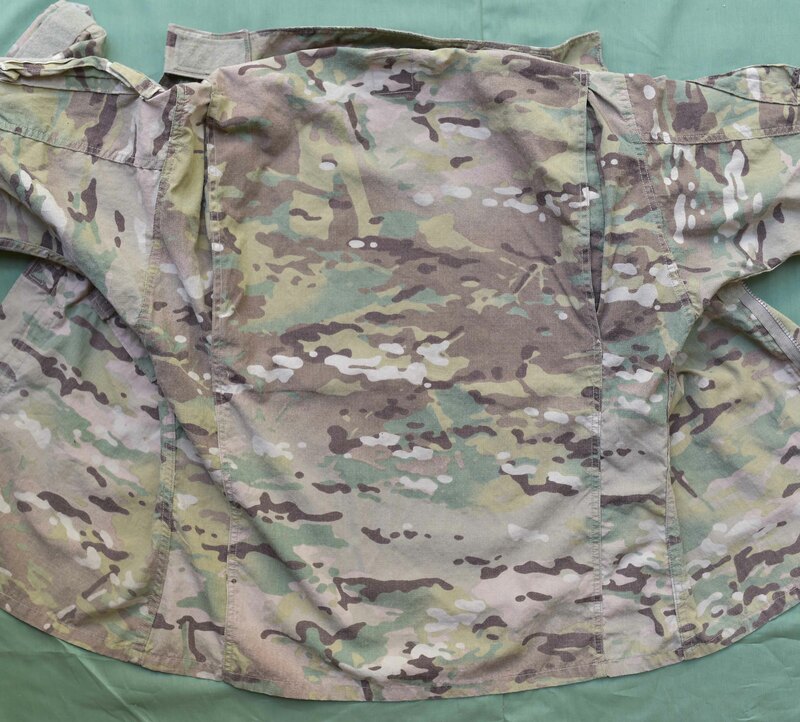 To simply and cheaply modify MultiCam (or similar) garments to improve them for use in dense dark forests (because MultiCam is a little too light for dark forests). Only one colour paint has been used (deliberately, to keep it simple and cheap), but two or three suitable colours should give a better result. MultiCam copy pinned to a board before cabbage is arranged over it and then spray paint applied, for the dark forest modification. In this photo the darkest colour has not been reproduced accurately and looks black when it is actually a very dark brown. 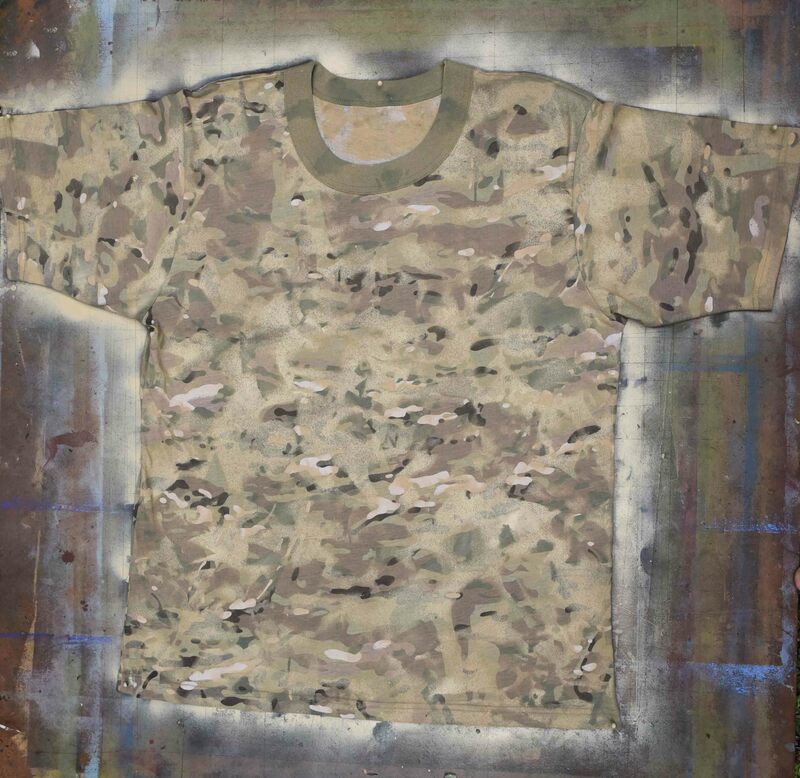 MultiCam shirt (used). Photo: David Clode. 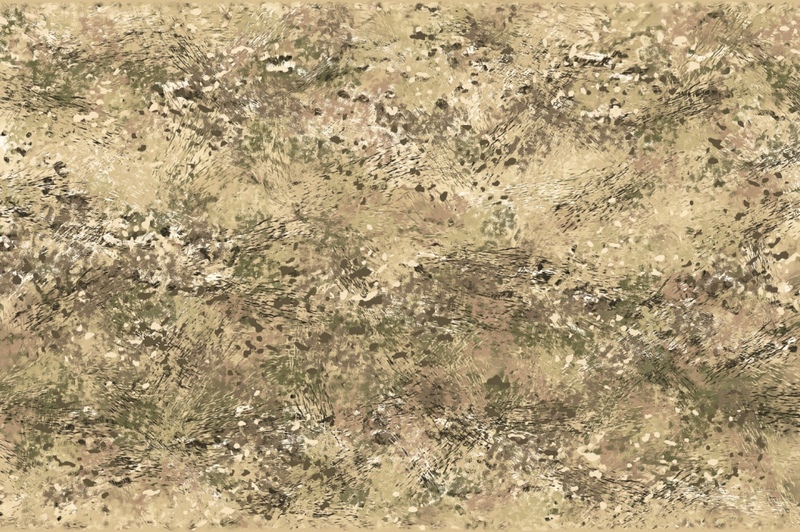 The aggregate score method will be applied (see the Testing Camouflage page for an explanation of this method of assessing camouflage designs). 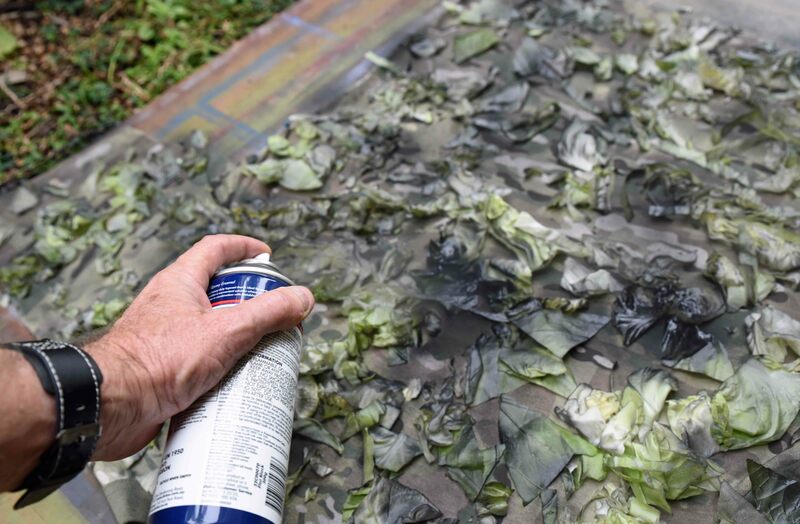 Apply chopped up cabbage (or kale may be better) and then spray flat/mat black paint to darken the camouflage, possibly adding a micro pattern (by using finely chopped up cabbage), and possibly increasing disruption. Cabbage is heavier and so is better than torn paper which tends to move around when spraying, plus it provides more natural looking results. 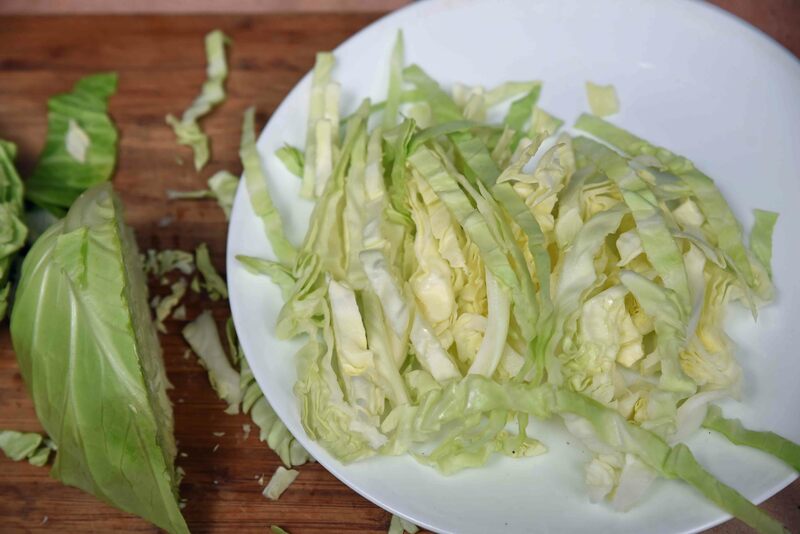 Cabbage is chopped up or torn into small thin strips, and even smaller pieces, as well as larger chunkier pieces (around 2.5 cms/1 inch to 7.5cm/3 inch diameter pieces). In this example I have kept it simple, but the cabbage would be better if it is cut into curving shapes. A large cookie cutter may be helpful with this. Mix up the different sizes and spread on top of the garment. 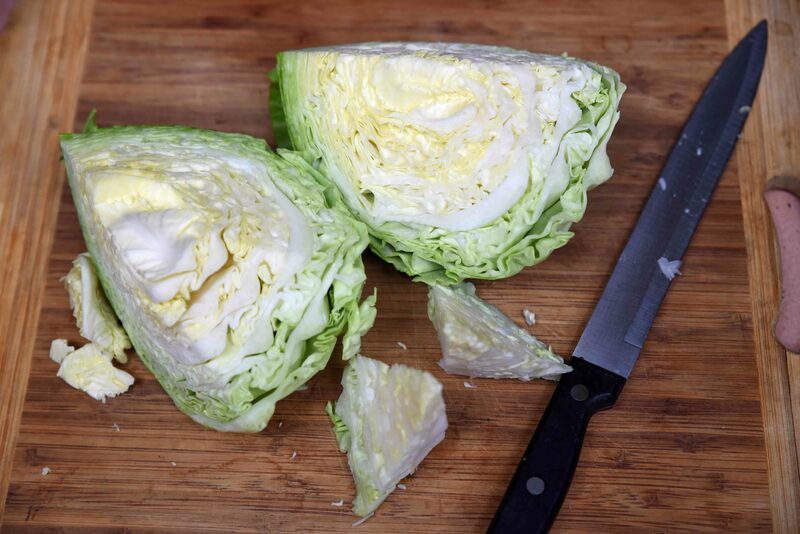 Half a cabbage cut into quarters and the core removed. 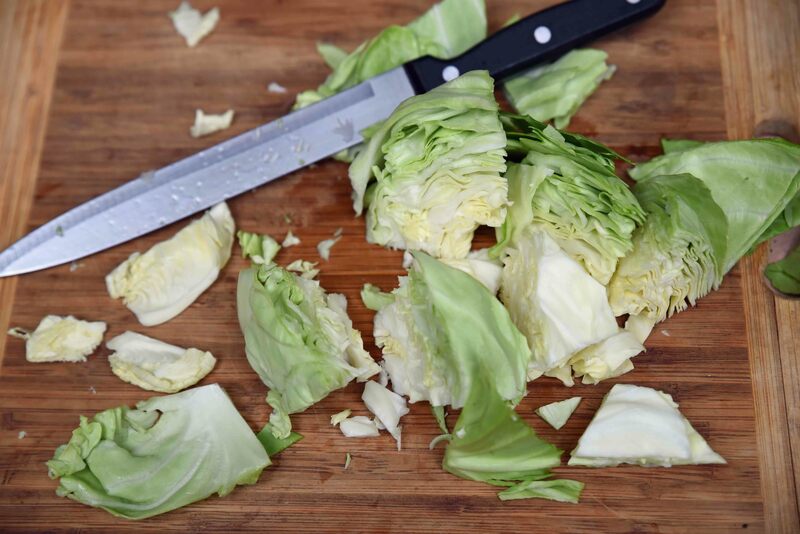 Thin strips cut from the cabbage. Thin strips chopped up into smaller pieces. Randomly cut larger chunks, which still need to be separated into individual leaves. For a dark forest, the camouflage should be darker, so cover most of the darker greens and browns. In other words, cover what you want to keep, and leave exposed most of the lighter greens and lighter pinkish brown, that you don’t want as much, so that they will be darkened by the black paint. 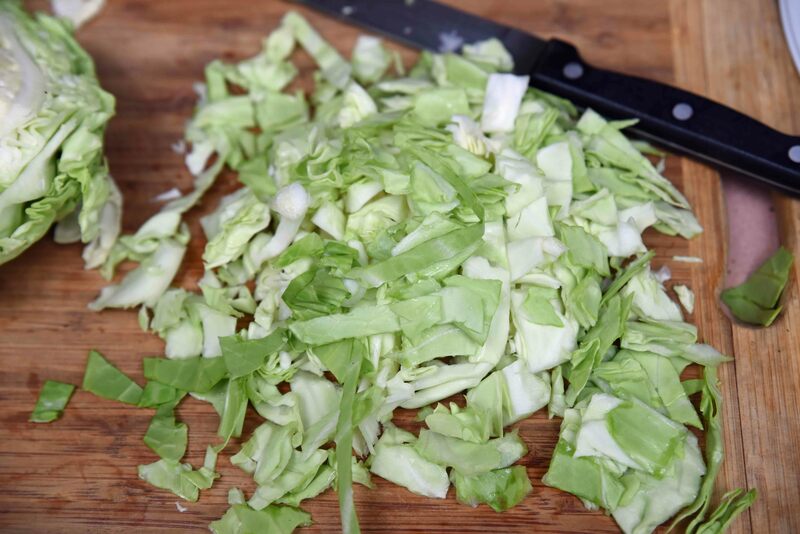 Then add a small amount of finely cut cabbage randomly over the whole shirt. 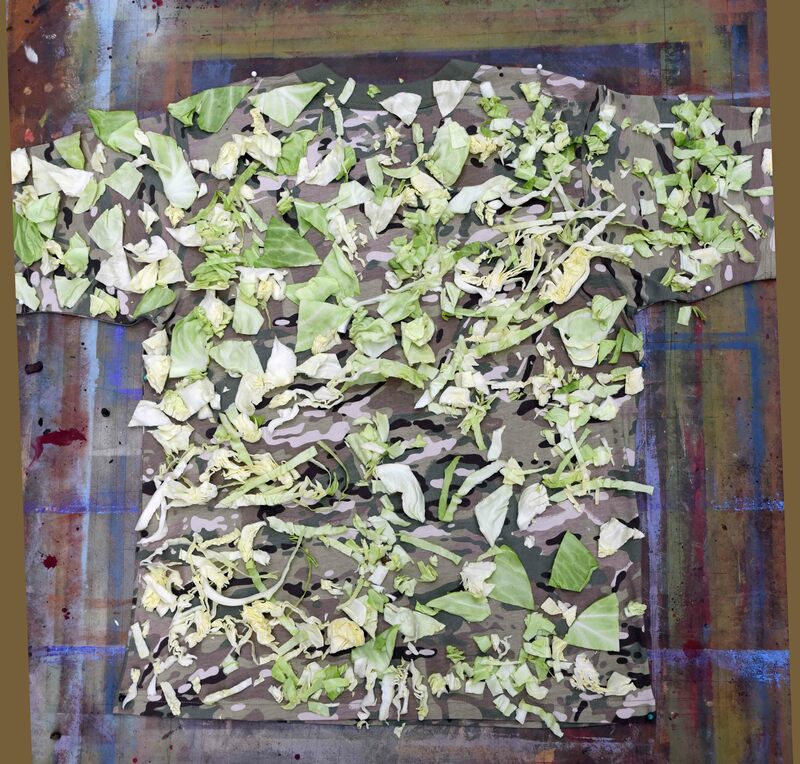 Shirt with cabbage before spraying for the dark forest design. Spray from different angles (stand at two or three different spots around the garment) and move your hand around at different angles while spraying (can nozzle about 4 inches/ 10cm or so away, or whatever works for you). Also, cabbage can be added and/or taken away between spraying for a variety of effects (not done in this simple experiment). 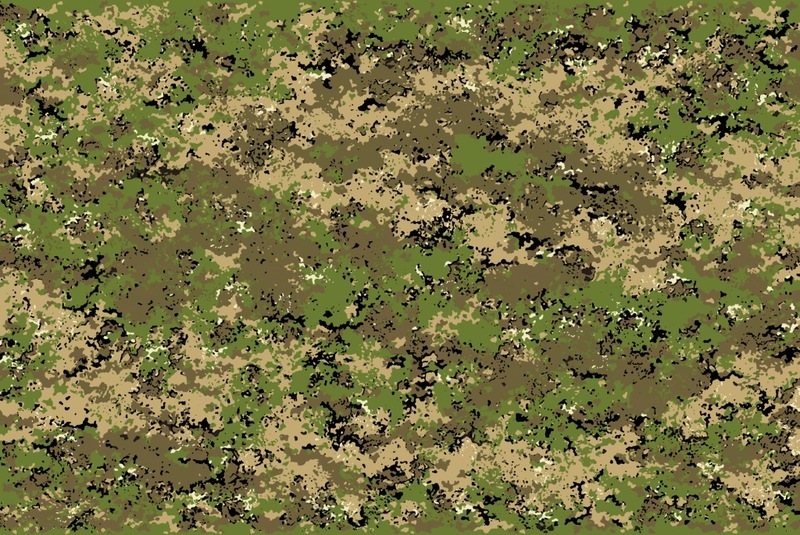 This method also enables a camouflage pattern to be counter shaded, in other words, the shoulders can be made darker, and the armpit and groin areas can be made or kept lighter (counter shading can be very effective and is seen in many animal species, but generally not in man made camouflage patterns). Spraying from different angles. It is probably best to wear gloves and a mask, but enough with workplace health and safety. Shirt covered with cabbage and sprayed. Remove cabbage (tilt the work board up, so that the top faces down slightly, knock the back of the board firmly, and then remove the small stuck on bits of cabbage) and allow paint to dry. Leave garments in a dry airy place for a few days, then wash and air again. Perhaps bury in the ground or in a compost heap for a few days. Job’s not done till you have cleaned up. There is now more black on the garment, with sharp edges and blurred edges, and the design has also become more omni-directional and has less of a horizontal orientation. It would have been an improvement to make the top of the shoulders darker, and to leave the armpits untouched (counter shading). Experiment. Finished dark forest shirt. Finished experiment above, control below. Control. MultiCam copy pinned to a board before adding cabbage and spraying paint. 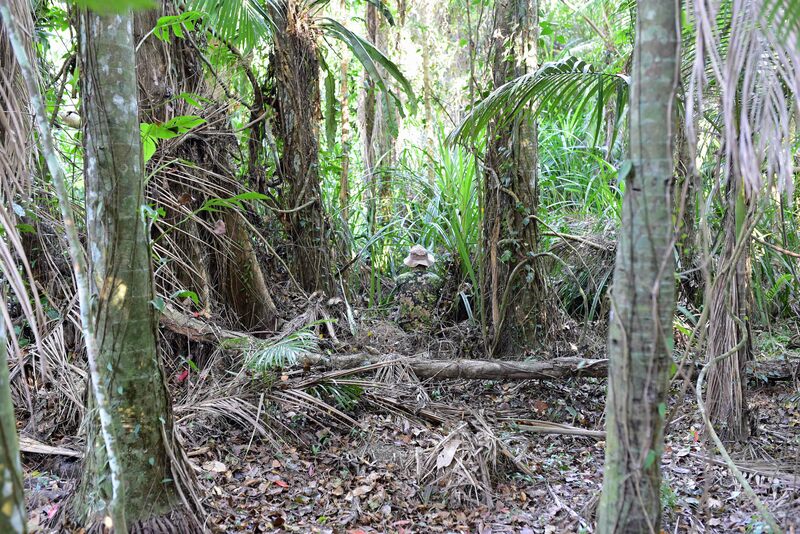 Tests in actual terrains show that the darker sprayed camouflage works better inside the forest, and is slightly better at the edge of the forest, and slightly better against dark tree trunks than the control (MultiCam copy). Overall, the sprayed design is significantly better, and therefore worth doing. See the aggregate score and the photos below. Control. 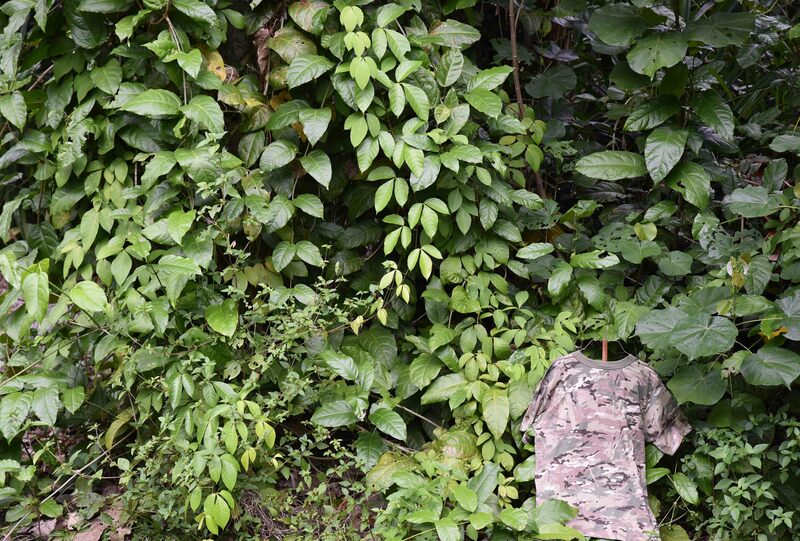 MultiCam copy in a tropical rain forest works well. Photo: zoom lens at 70mm, David Clode. Experiment. The black spray paint/dark forest version is slightly better. Control. 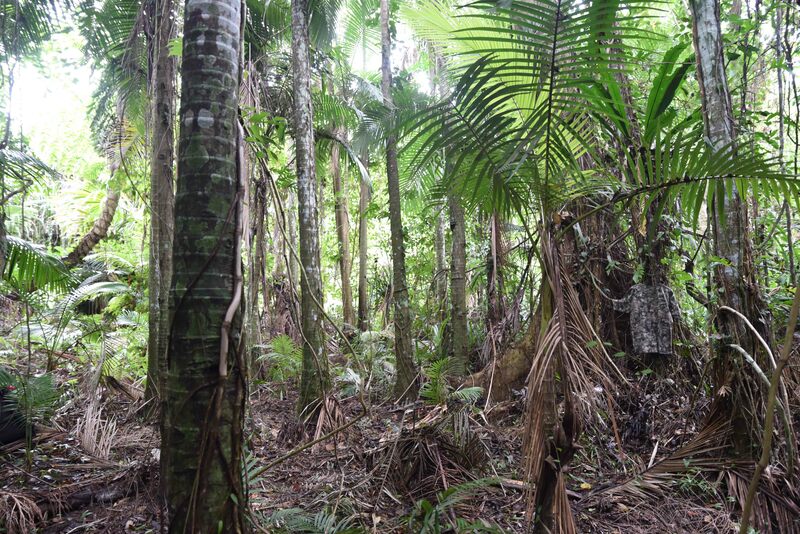 MultiCam copy inside a tropical rain forest from 7 metres away. It worked better than I thought it would. I thought it would look a little lighter than this and stand out more. This copy is darker than MultiCam, so genuine MultiCam would in fact stand out a little more than this (see photo taken months later below). Nevertheless, with just a cursory glance, it would be missed by most. Photo: David Clode, zoom lens at 24mm. 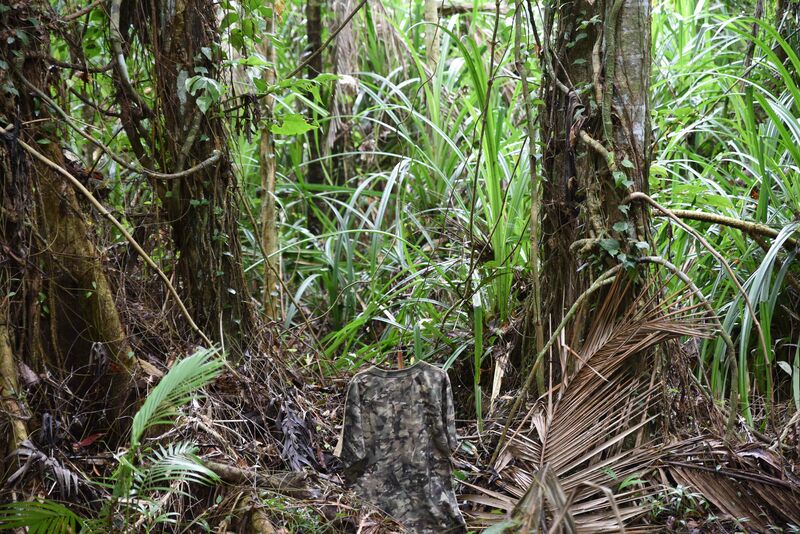 MultiCam (used, genuine) in a tropical rain forest. Test and photo: David Clode. 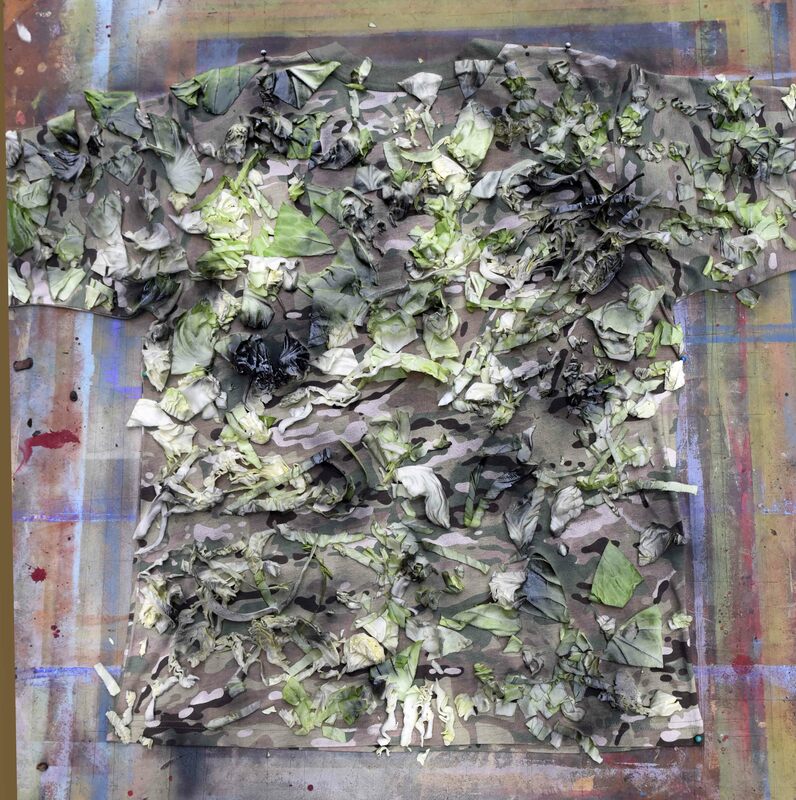 Multicam copy T shirt modified to suit a dark forest interior, placing cut cabbage over the shirt and spraying with mat black paint. Slightly but significantly better then the control. Photo: David Clode. 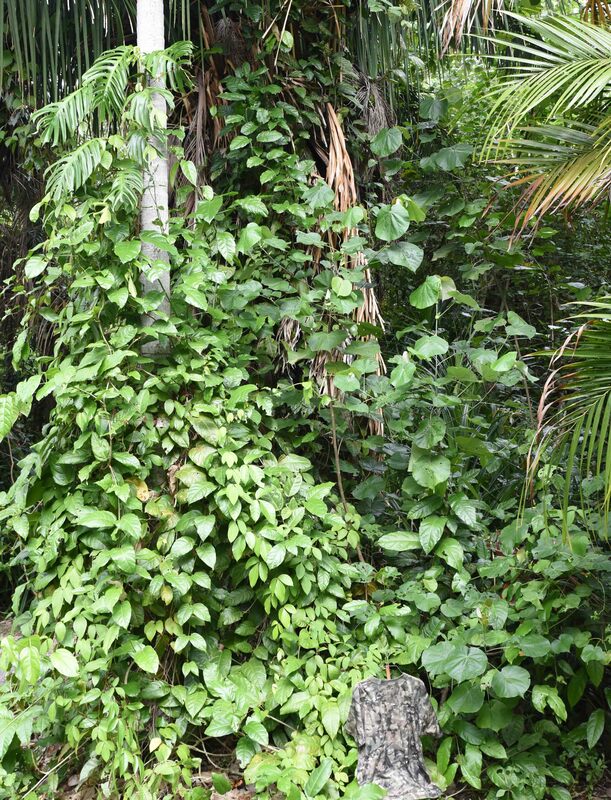 BondCam Rain Forest 2 M1 S Super Digital 2 T-shirt worn in a tropical rain forest. Design, test and photo: David Clode. Control. 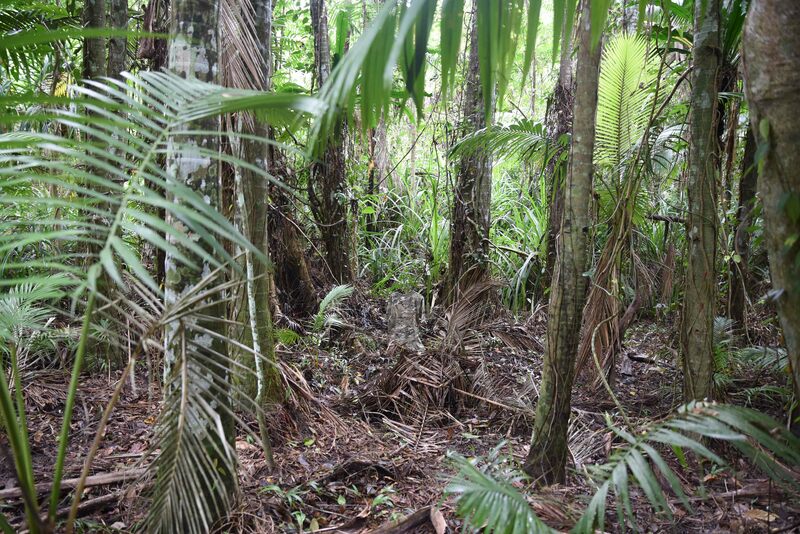 MultiCam copy on the edge of a tropical rain forest. Much too light (remember MultiCam is even lighter) and not so good in this terrain which has nearly all saturated green and black colours (the very darkest colour in MultiCam is a very dark brown, not black). Photo: David Clode. A marginal improvement. Darker and more subdued, and therefore less noticeable, even though the green doesn’t match and there isn’t much green. The use of some bright mid green paint (Kermit the frog green) as well as the black would have given a better result for the forest edge. In some cases a dark green would be better (see the photo of the three soldiers wearing CADPAT woodland on the Home page of this site). MultiCam Tropic would work well in this terrain, as well as many of my BondCam camouflage designs. Score: 5/10. Experiment. Dark forest version on the edge of a forest. David Clode. 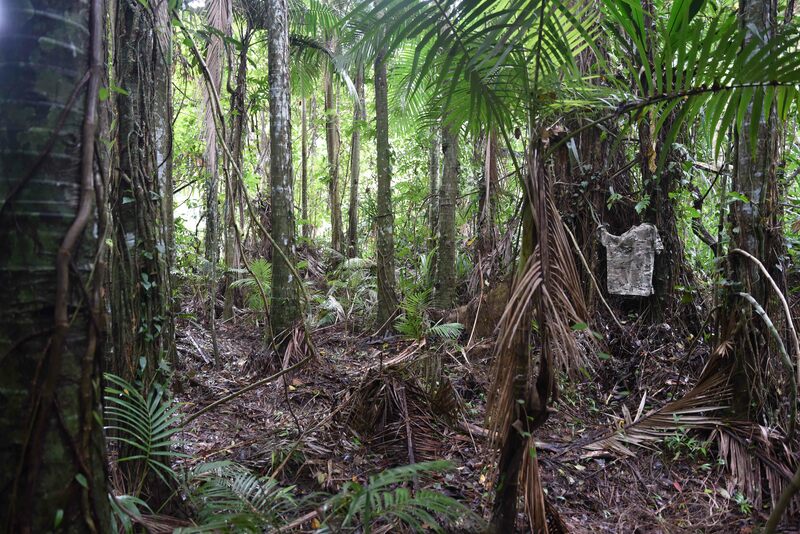 Rain forest 2 M1 S Super Digital 2 T-shirt worn on the edge of a tropical forest. Photo, desin and test: David Clode. Dark forest version works well on the ground. Control (MultiCam copy) against a tree trunk in the interior of the forest. Obviously too light against a dark tree trunk. Experiment. Not dark enough against a tree trunk, but much better than the control. Since it is lighter, MultiCam would be perhaps 4 to 4.5/10. Total score: 20/30 or approximately 6.5/10. The score could also be expressed as a percentage, i.e., 65% effective. 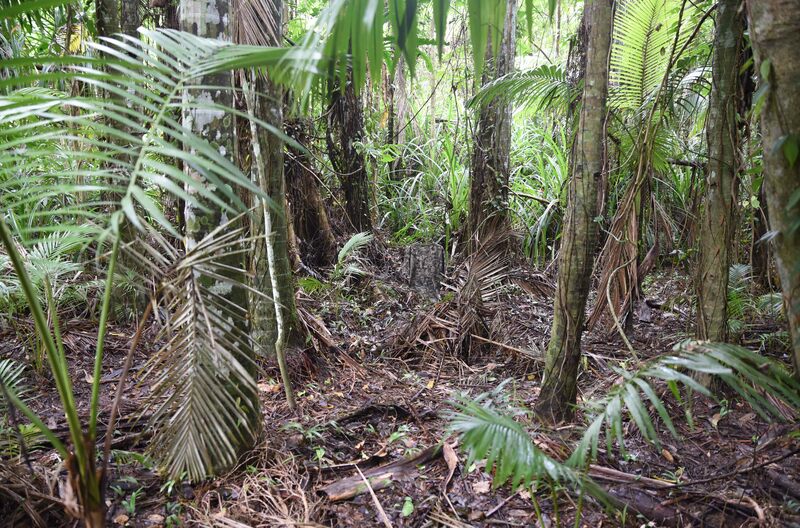 The forest interior could have been given a greater weighting, or the forest edge, depending on whether more time is spent in these subterrains, or if there is increased likelihood of casualties or injuries, in a particular subterrain. The black spray painted darker version is significantly better in three dark dense forest subterrains than MultiCam (and its derivatives). The spray paint modification is therefore worth the trouble. BondCam Multi Ops Dark. A design which would work reasonably to very well in all three subterrains. The dark spray painted version worked surprisingly well in Guinea grass, at least in the darker lower half of the grass. 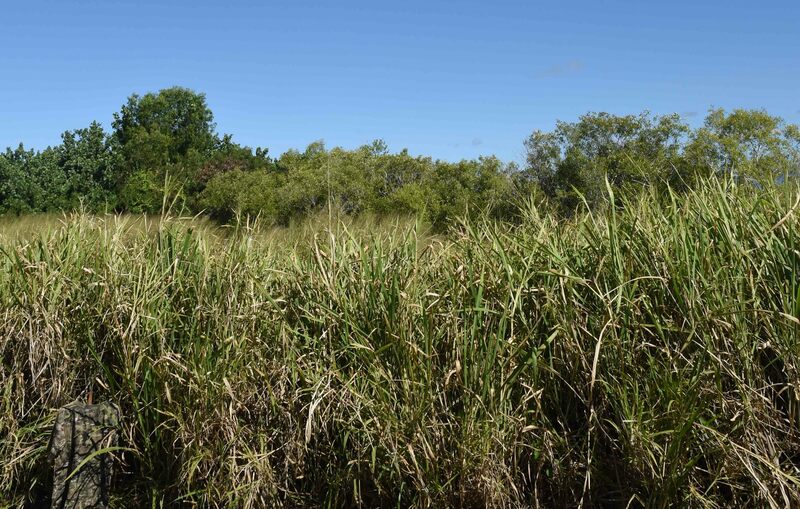 Guinea grass is one of the most common grasses in wet tropical regions around the world. 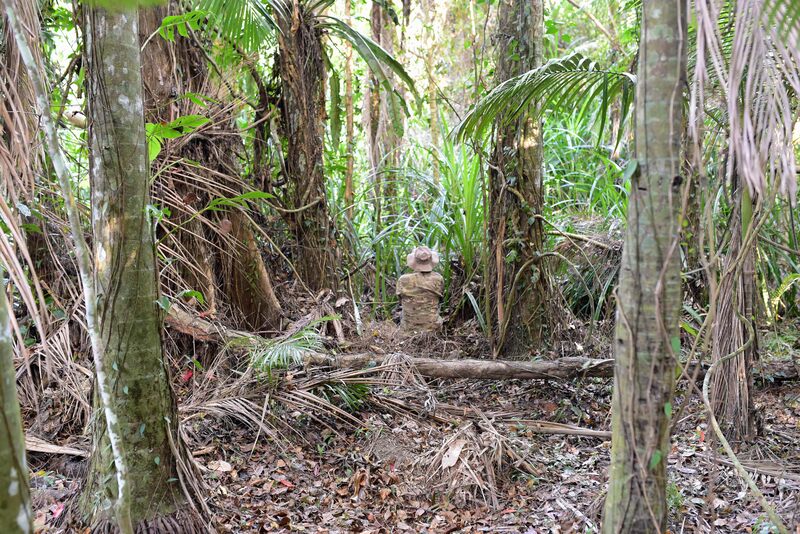 Photo and camouflage: David Clode. US woodland copy (darker than the genuine and perhaps a little too contrasty) for comparison – works well, as would be expected, but too dark for the in between space/forest floor, and the forest edge. This shirt could be improved by spraying with the dead palm leaf colour for the forest interior, or with Kermit the frog green for the edge of the forest. 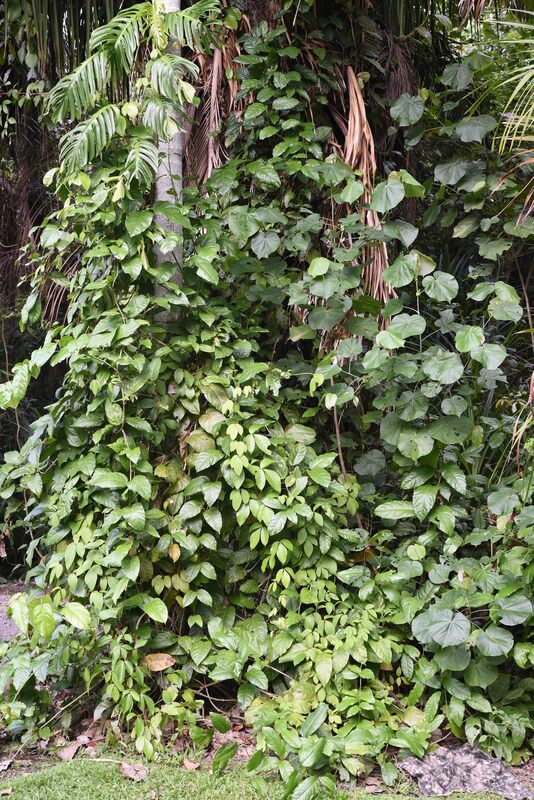 The light coloured stripes mimic lianas (jungle vines) rather well. 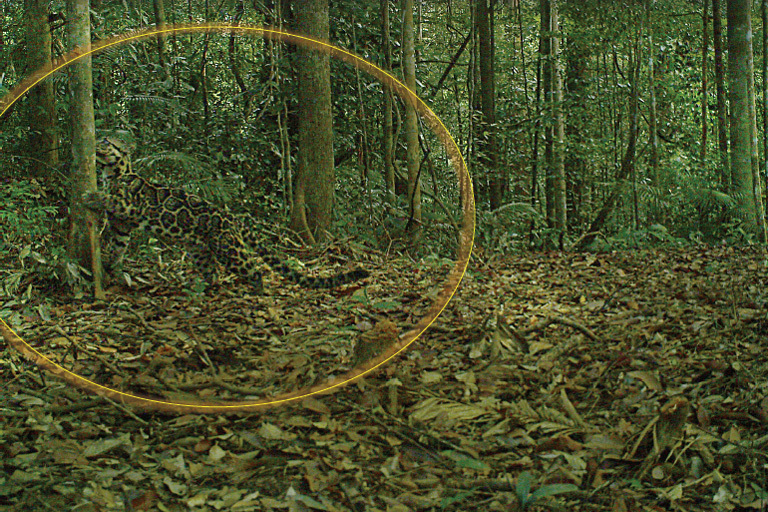 See the similar Clouded leopard camouflage in the photo below. Clouded leopard, an Asian rain forest cat. Somewhat similar camouflage to the dark US woodland copy. 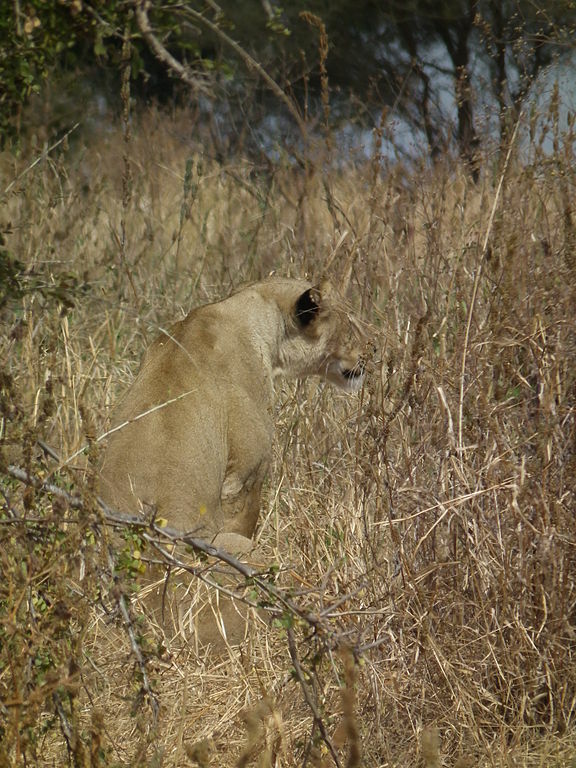 Photo: Mongabay. Genuine US Woodland. 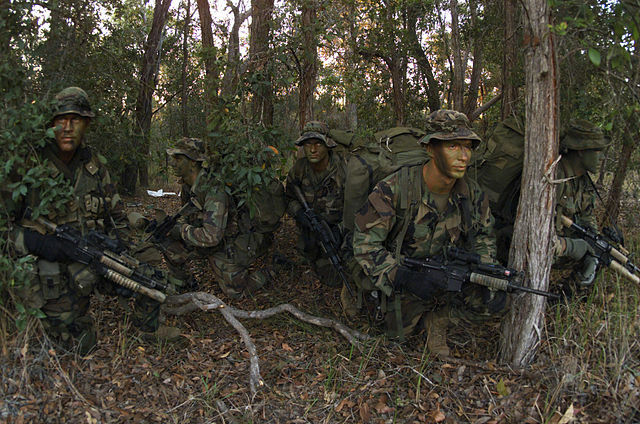 US marines on recon exercise. Photo: Duffman-wiki. US Woodland is very effective in dark forests. MultiCam and MTP are a little too dark and too green for most semi-arid and desert terrains. Australian MultiCam would be slightly better, and MultiCam Arid is available for more arid terrains. 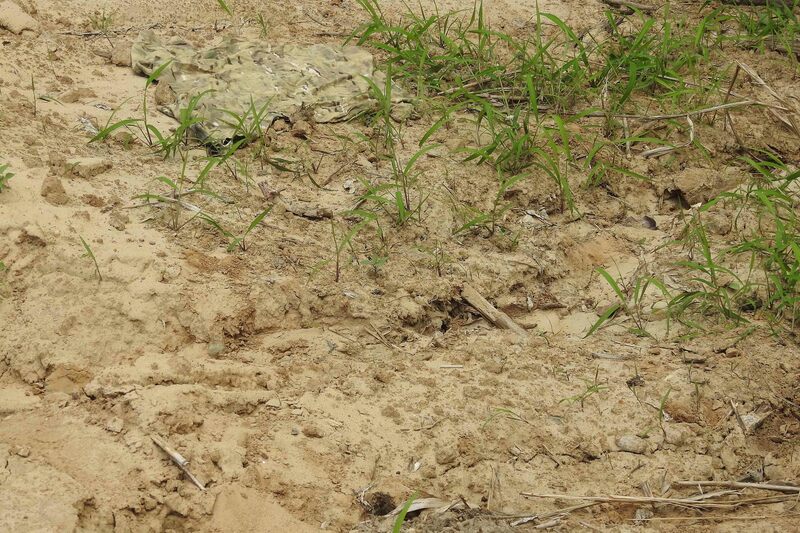 A semi-arid modification experiment is shown below, with light yellow ochre (“Harvest”)spray paint, intended for rocky or stony deserts and semi-deserts, but may also work well enough in dry grassy woodlands. Perhaps a lighter colour, like the light colour in British Desert DPM would have been better, and would have resulted in an overall lighter and more contrasty design (and been slightly superior in my opinion). In this case much of the lighter pink and brown was covered with cabbage in order to preserve those colours/tones, and most of the greens were left exposed so that they would be largely covered by paint. The cabbage could be arranged in a more horizontal way for a desert version (e.g. for soldiers of democratic countries), or more vertically for a dry grassland or grassy woodland version (e.g. 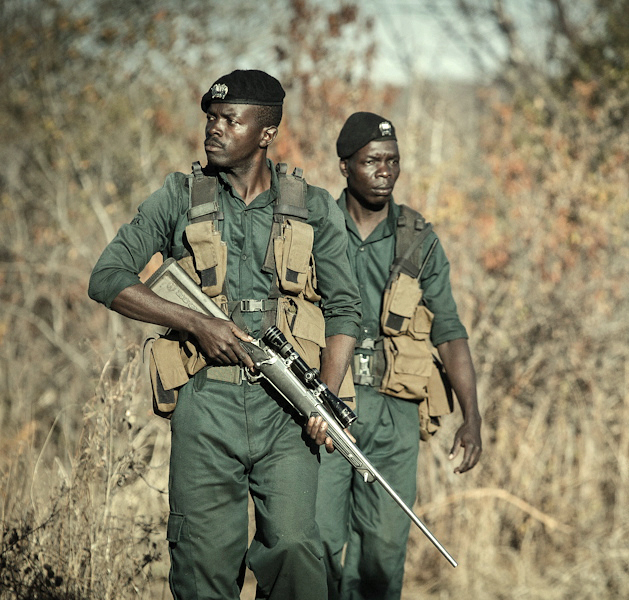 for anti-poaching rangers in Africa or India). A light grey paint instead should produce an acceptable urban camouflage, and perhaps a darker grey or grey brown for some rocky terrains. Shirt largely covered with cabbage for the semi-arid/desert version. It can be seen that the greens are left exposed to be covered by the light paint. Experiment. Desert. More light coloured paint added after the cabbage was removed. David Clode. The shoulders could have been left darker, and the armpits and groin painted lighter with more coverage (counter shading). 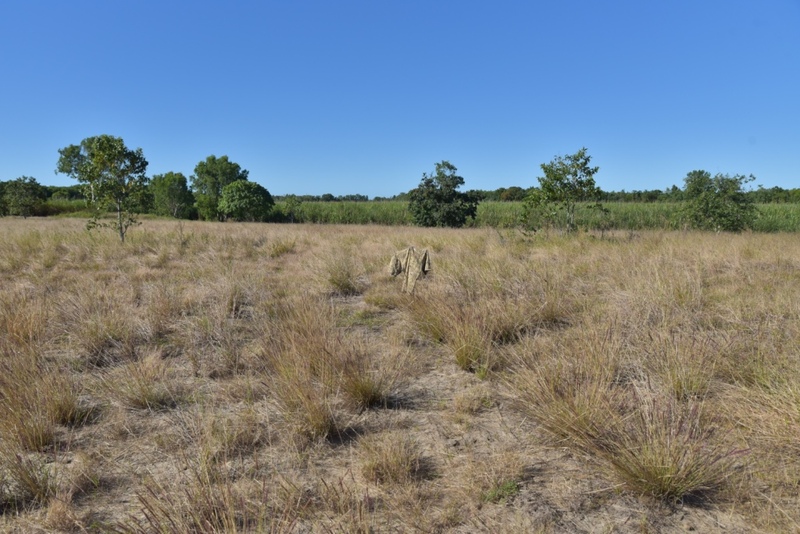 Semi-arid spray painted version in a dry grassland, Yorkeys, North Queensland, Australia (sunny, windy day, about 4pm/1600 hours). Slightly light and yellow in this dry grassland. Not exceptionally good, but better than the MultiCam copy where the contrasting and comparitively bold pattern stood out in this relatively featureless terrain. Also, not unexpectedly, the MultiCam copy was too green. The dark forest version was obviously too dark. 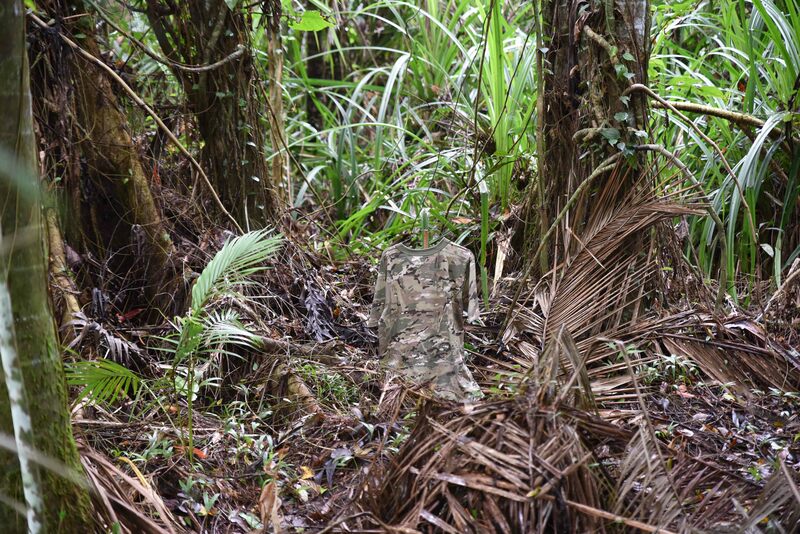 Anti-poaching personnel need better camouflage for this terrain, for their own safety, and to be more effective in saving endangered wildlife. Photo: National Geographic. 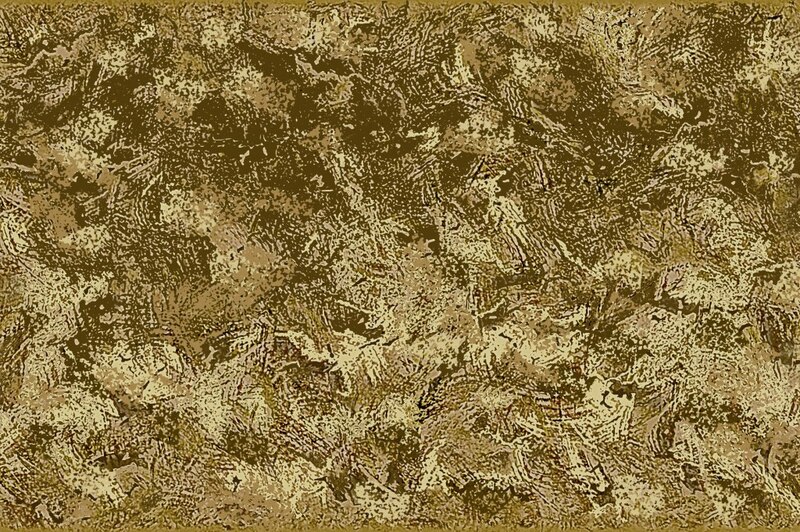 MultiCam Arid would be reasonably good in the above terrain, but many of my BondCam camouflage designs are specifically designed for this terrain and type of work and are likely to be superior. 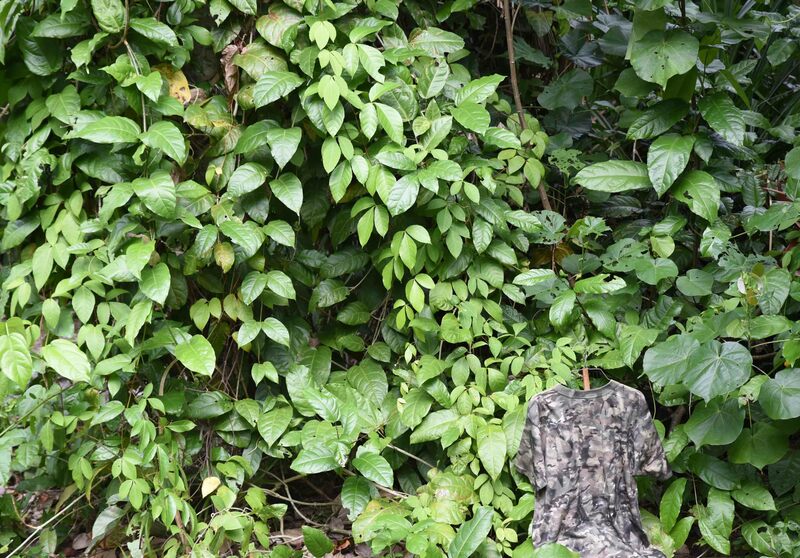 See the “Anti-Poaching Camouflage ” page on this site. BondCam OmniTerrain M2 Dull Dry, would be effective for anti-poaching, and I suspect better than MultiCam Arid, and better than the spray painted T-shirt. Colours and tones can be fine tuned for a specific terrain, for example, slightly darker for the terrain in the photo below. The lions have better camouflage! Simple matching of tones and colours, and counter shading (darker on the shoulders and back, lighter on the belly and chest). Tanzania. Photo: Nevit Dilmek Wikimedia. Better than the lion? BondCam Abstract African Bush M4 Dull. Desert modification in a dense dark forest. Camouflage needs to be appropriate for the terrain. Equally, the dark forest version would not work well in a desert. David Clode. I hope this is helpful to soldiers of democratic countries (if you can get away with it), anti-poaching rangers, wildlife photographers (which is what I’ll be using this for), bird watchers, paint ball enthusiasts, etc. Thanks to Matthew Dermody and Allan Osment for their helpful input.